Sprouting is good for you. It increases the digestion and health benefits of whatever seed is sprouted. Sprouts are the stage a seed goes through as it comes to life but before it establishes roots and becomes a plant. Most beans, seeds and grains sprout but like everything else, some are preferred for ease and because they taste better. Sprouted seeds are so versatile, they can be enjoyed whole as snacks or made into nut milks, added to smoothies and salads and even used dehydrated in trail mixes. Alfalfa seeds: Contains phytoestrogens which have been linked with the prevention of cancer, heart disease as well as osteoporosis. Great in salad, sandwiches and egg dishes like omelet’s. Broccoli: Contains sulforaphane which is associated with cancer prevention. Excellent in salads with its mild peppery flavor. 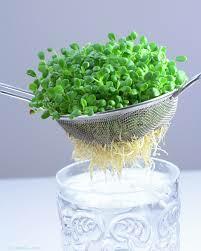 Broccoli sprouts have proven themselves to be one of nature’s most valuable health-promoting foods. “ Three day old broccoli sprouts consistently contain 20-50 times the amount of chemoprotective compounds found in mature broccoli heads and off a simple, dietary means of chemically reducing cancer risk”. Clover: High levels of isoflavones which are associated with cancer prevention. The texture is similar to alfalfa and they are great used raw in sandwiches or salads. Lentil: This sprout contains protein…26% to be exact. It can be enjoyed raw or added to steamed veggies, stir-fries and soups. Radish: High in calcium and vitamins A and C with a nice peppery flavor. Best in salads and sandwiches or as a garnish since it does not hold up well to heat. Sprouting seeds at home only takes minutes a day but the reward is a fresh supply of fresh crunch shoots loaded with nutrition. The seeds of many veggies, grains and beans are perfect for hydroponic sprouting into tasty young shoots ready to be enjoyed by the entire family in less than a week. Purchase a large mouth 1-4 L glass container. Place approximately three tablespoons sprouting seeds (organically grown seeds specifically intended for sprouting) with three times the amount of purified water into the jar. Shake the jar gently with the lid on until all seeds are thoroughly soaked. Remove lid and place cheesecloth over the mouth of the jar securing with rubber band and tie of some sort. Allow seeds to soak at least 6-12 hours away from direct sunlight. Sprouts must be rinsed often to avoid mold growth. Repeat process as needed until sprouts manifest completely. You can begin harvesting sprouts when they are 3-5 centimeters long. Rinse and drain thoroughly, place in an airtight container and refrigerate right away. They should remain fresh for up to 5 days. You can also grow sprouts in soil and many people believe this is easier, less time consuming and produces more nutritious food. Using the jar method, requires you to rinse a few times a day to avoid any kind of mold growth. You can also produce way more sprouts in much less space without the jars. Healthy eaters consume many sprouts because they are rich in protein, minerals and vitamins and can easily be sprouted indoors year around. Eating sprouts is just one of many tactics you can employ to boost your immune system and defend yourself against dangerous life threatening diseases such as cancer and heart disease. Wouldn’t you like to know right now if there is an invisible cancer threat hanging over your head? If you’re curious take this 1 minute test to find out how you fare on the Cancer Risk Scale.